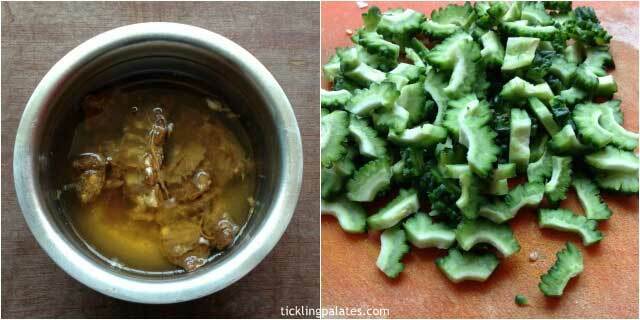 Pavakkai puli kulambu recipe with step by step pictures. 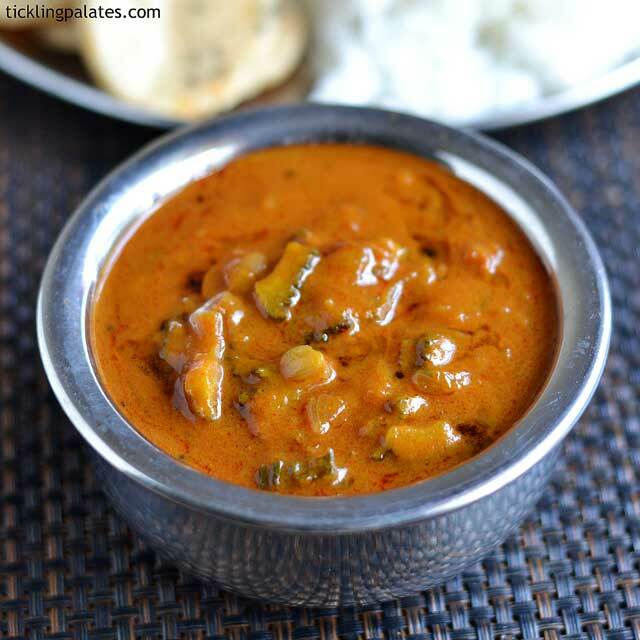 A delicious south indian kuzhambu made using pavakkai. Pavakkai is also known as Karela in Hindi and Bitter gourd or Bitter melon in English. As going by the name though it does taste bitter, when cooked the right way you can easily tame the bitterness and reap its benefits. I have made this pavakkai puli kulambu in a simple way following my MIL’s method. Though I do love the Chettinad way of making this pavakkai kulambu which is a bit elaborate as it involves grinding of ingredients which is worth the effort and time, I love the simplicity of making this kulambu for lunch. Though almost all the kids hate pavakkai, my kids are okay with it. Though they don’t love it with much gusto at least they do not point blank refuse to eat it when cooked. They infact love this midhi pavakkai poriyal very much. 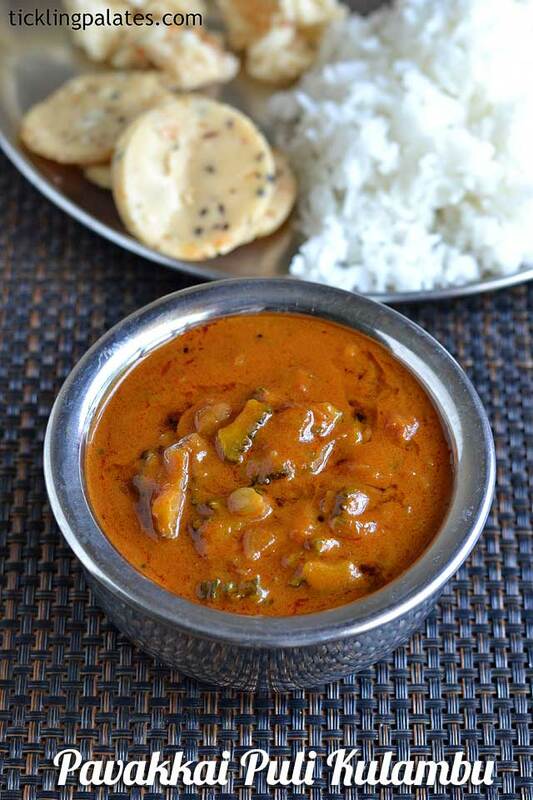 They prefer pavakkai puli kulambu than when compared to make the regular into a poriyal or curry. I love eating this pavakkai puli kulambu with stove top roasted pappads (Sutta Appalam) very much. When you take the time to cook the pavakkai before proceeding to make the kulambu you will not taste any bitterness at all while eating. You will need at least double the amount of tamarind that you use while making other varieties of puli kulambu. 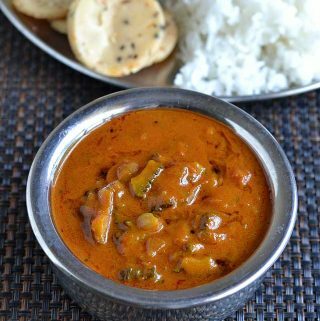 It is to balance the bitterness and also a little amount of jaggery is added towards the end of making this pavakkai puli kulambu which will totally erase any sort of bitterness completely. 1. Soak tamarind in warm water. Extract pulp and keep aside. 2. Chop the sambar onions and pavakkai finely. 3. 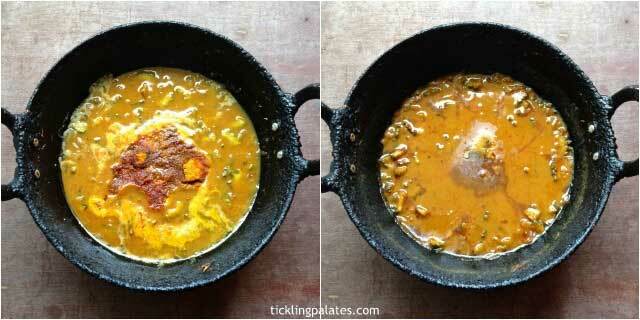 Heat a pan with oil and temper with vengaya kari vadagam and channa dal. Add sambar onions and cook till they turn translucent. 4. Add pavakkai and cook over low flame till they shrink in size and shrivel. 5. Add tamarind extract, turmeric powder and bring to a boil. Add red chili powder, sambar powder, salt and cook for 4-5 mins over low flame. 6. Finally add jaggery and take off stove. Pavakkai puli kulambu is ready to be served hot with rice. 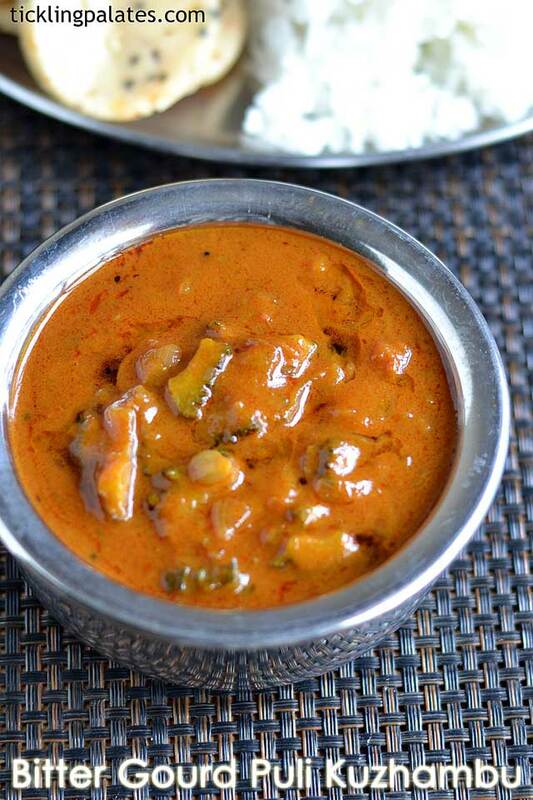 South Indian Pavakkai Puli Kulambu that's served with rice. Soak tamarind in warm water. Extract the pulp and keep aside. Slit the pavakkai into 2 and take out the seeds from the middle. 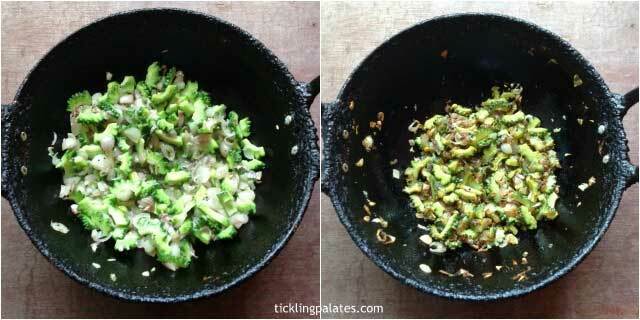 Chop each part into thin slices. Chop the sambar onions finely. Heat a pan with oil. Add vengaya kari vadagam and channa dal for tempering. Add sambar onion and sauté till they turn translucent. Add the pavakkai slices and simmer the flame completely. Cook for 4-5 minutes turning them often till they shrink in size and shrivel considerably. Add tamarind pulp, turmeric powder, more water if needed to the consistency you prefer and bring it to a boil. Add sambar powder, red chili powder and salt. Mix well, close with a lid and cook over low flame for 4-5 minutes. Add jaggery, mix and switch off the stove. Pavakkai Puli Kulambu is ready. Drizzle 1-2 tsp of sesame oil on top and close the pan tightly with a lid (this step is optional) and let the kulambu sit for another 5 mins for the flavors to merge well. Serve with hot rice and any side dish of your choice. Using sesame oil gives an authentic taste. If you do not like the flavor use any vegetable oil.